HUNTINGTON, W.Va. – The Chemical Alliance Zone’s Chemicals and Materials Commercialization Fund has awarded $20,000 to a Marshall University scientist to help bring to market a technology he has developed for repairing skin injuries. The award to Dr. Jingwei Xie of the Marshall Institute for Interdisciplinary Research (MIIR) will help Xie’s research team produce device prototypes and samples, market to potential customers and conduct patent analysis. 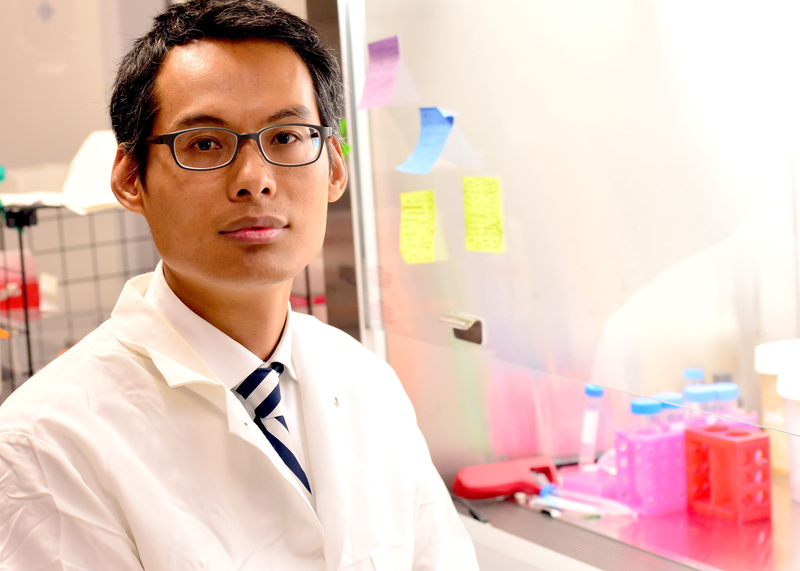 Research in Xie’s lab involves using one of science’s fasting-growing fields to develop products that can be used to improve treatment of burns and other skin wounds. 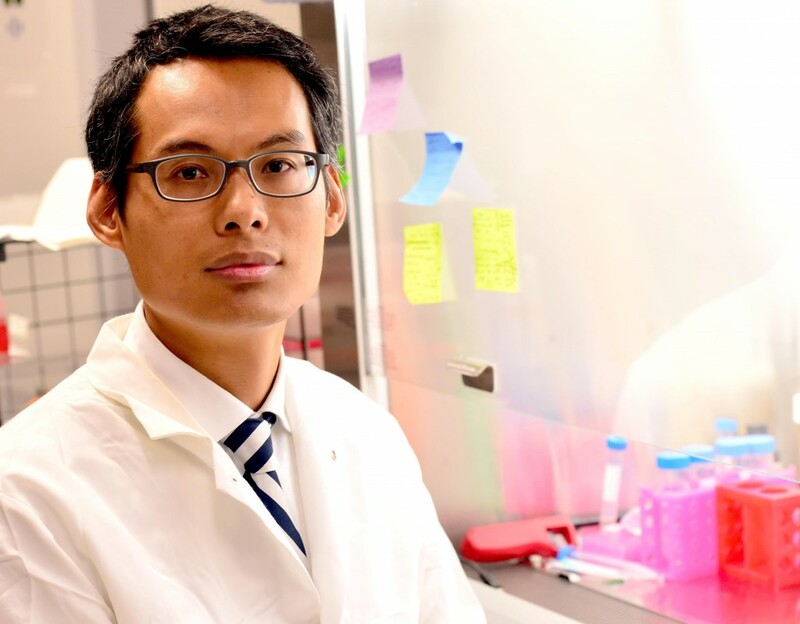 He and his colleagues at MIIR, including postdoctoral fellows Dr. Bing Ma and Dr. Jiang Jiang, are using nanotechnology to create scaffolds made of tiny fibers, invisible to the human eye, to be used as skin grafts. According to Xie, their devices also can be used to deliver medications topically for chemotherapy, anti-infection or pain relief purposes. 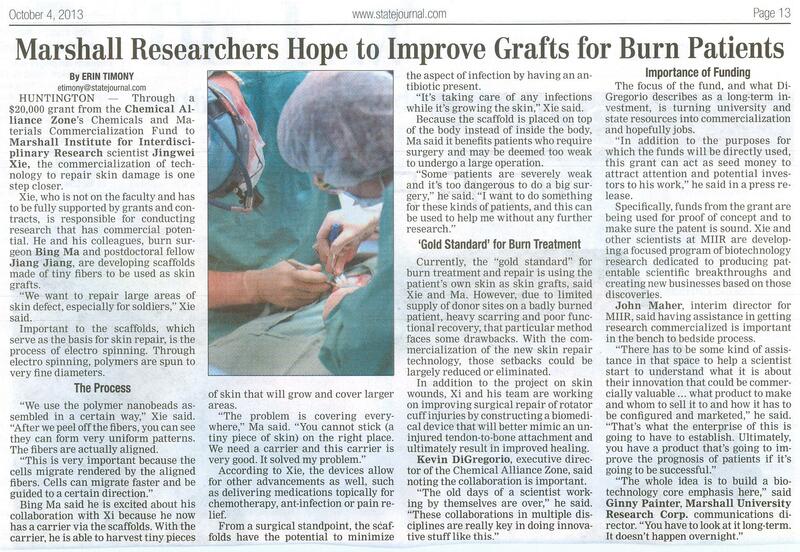 He added, “The treatment of large-area, full-thickness burns still constitutes a major surgical repair challenge. The current clinical ‘gold standard’ for burn wound treatment and repair is to use patients’ own skin as skin grafts to close the wounded area. This method can have a number of drawbacks, including the limited supply of available donor sites on a badly burned patient, heavy scarring and poor functional recovery. Xie joined MIIR in January 2011. With more than 10 years research experience in regenerative medicine, tissue engineering, biomaterials, nanotechnology and micro-/nanofabrication, he has developed a number of projects related to biomedical applications, including neural tissue engineering, tendon-to-bone insertion site repair and drug delivery. He and the other scientists at MIIR are developing a focused program of biotechnology research dedicated to producing patentable scientific breakthroughs and creating new businesses based on those discoveries. In keeping with the institute’s goal to be self-sustaining, Xie is funded entirely through external sources. He is the co-inventor on five patents and has co-authored more than 40 peer-reviewed journal articles. In addition to the project on skin wounds, Xie’s team is working to improve surgical repair of rotator cuff injuries by constructing a biomedical device that will better mimic an uninjured tendon-to-bone attachment and ultimately result in improved healing. For more information about Xie’s research or MIIR, which was created in 2008 through the state’s “Bucks for Brains” West Virginia Research Trust Fund, visit www.marshall.edu/miir.